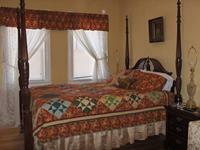 Lucy's Place has four guest rooms; the rates below are based on double occupancy. A full breakfast is served each morning May 1 through October 31; during the winter a full breakfast is served on Saturday and Sunday mornings only. All rooms have a mini-kitchen consisting of a microwave, refrigerator, coffeemaker and dishes. TV is available in the Great Room only. Wireless internet available. Cozy first floor room. Queen size bed, private bath with double-size whirlpool tub, hand held shower. $119/night. First floor room on the west side of the house. 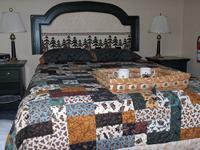 Traditional cherrywood four post queen size bed, private bath with double-size whirlpool tub, hand held shower. This room is wheelchair accessible. $139/night. Second floor room on west side of house.White wicker furniture, queen size bed, private bath with double-size whirlpool tub, hand held shower, fireplace. $139/night. Lots of windows in this room, great view of our gardens and Lake Superior. Second floor room with queen size bed, large sitting area which can be used for additional sleeping ($15 per person for more than two occupants over age 12). Private bath with double-sized whirlpool tub, hand held shower, fireplace. $149/night.